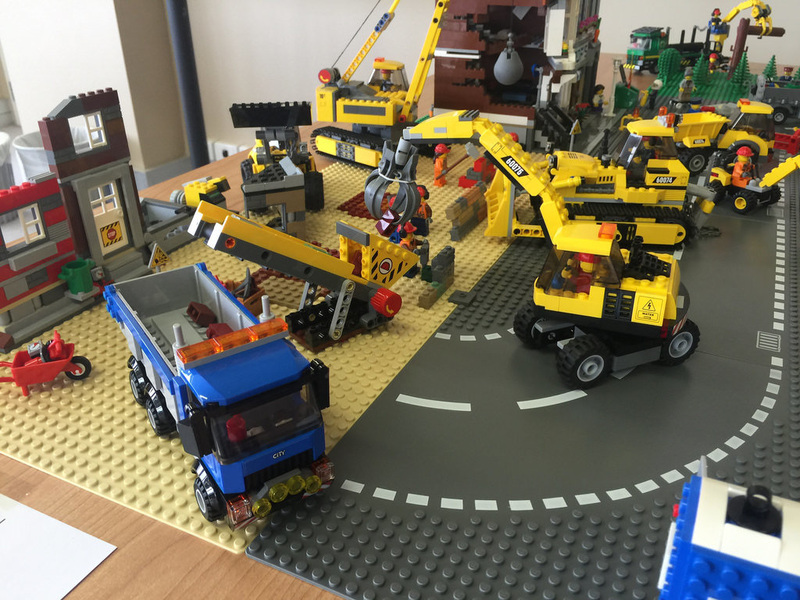 Last week I was able to show off my first big LEGO display, and over the next few days (and yesterday), I’ll be talking about it! Yesterday I went into the basics – choosing the theme, scale and sets, and working with others to get your display off the ground. Today I’ll be talking about the layout and MOCs. Planning the layout is a very important part, and a very fluid one too. Be prepared to change your layout a few times (even after putting it together!) as your ideas will change all the time. I used a big sheet of paper at first and got the basics down pat – the overall layout. Originally I was going to go with the buildings in the back row, with the train tracks in front. I didn’t even have road baseplates in the mix. I then thought I’d measure it out. The tracks were the parts that weren’t that fluid, so I measured them first and made the rest fit them. The next step was to measure the Modulars with the tracks. I soon realised that I had seriously underestimated the size. I had way too many 32×32 builds (the size of the modulars). I decided to do 6 plates in the back, with 3 on each side. At this stage I was still not going to use the road baseplates, but I needed a bit of space for the vehicles, so I made a few sketches to see what types I’d need. After figuring it out, I made a few queries with my local LUG and got a whole stack of what I needed. I lay them out on my floor, and once again realised I needed a bit more room! I made a few adjustments (the road between the town hall and fire department, and the corner around the Cinema) and I was ready to start planning the details. So, I knew where the parks would go, where each Modular would go, and where the roads would be. Time to fill this out! It’s really important in a City display to have things happening! 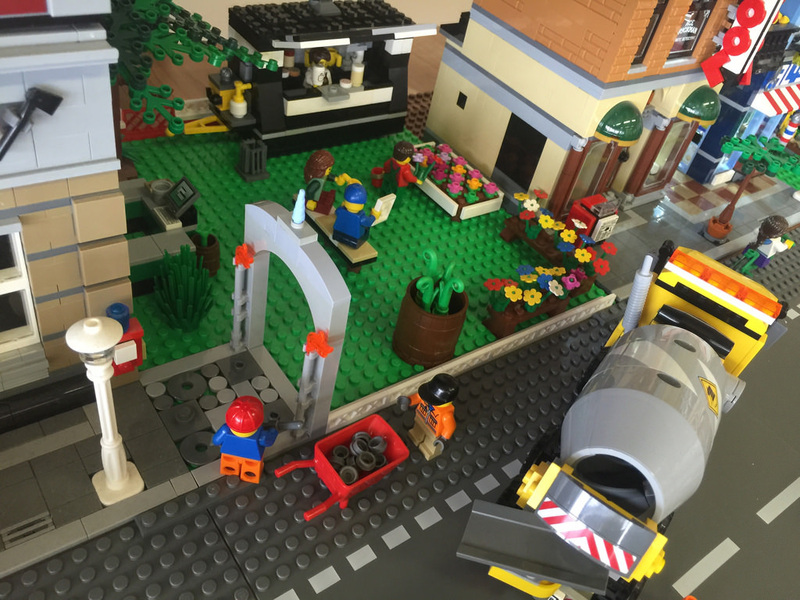 I decided to go with a few small detail points – a cement mixing team laying a new path (image above), a fire in a highrise (one of the Pet Shop brownstones), a demolition crew tearing up a block (the other brownstone), and some lumberjacks working hard. Having these little display sections makes people stay and look at all the little details they can find. Some of these will be planned, others will happen when you set up, but they’re still extremely important. One of the comments I had totally reinforced this “There’s so much going on! I don’t know where to look! It’s amazing!”. Hearing that made me feel pretty good. It was exactly the reaction I was going for. I had some work to do! The first one was the Hotdog stand. This one came together after looking at my lonely Hot Dog Man – he needed a purpose in life! 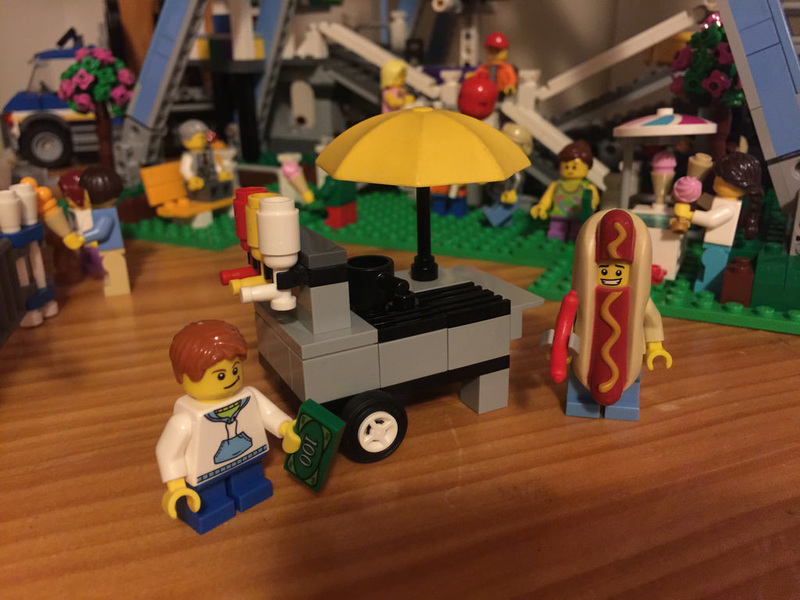 Interestingly enough, the yellow umbrella was the oldest thing in the display by my workings – it was from a Fabuland set from the 80s. I’m still not overly pleased with it, but it was a small build. I’ve since changed it again by adding a whole lot more hot dogs, and a little fridge underneath it. Next up was the outdoor garden centre. 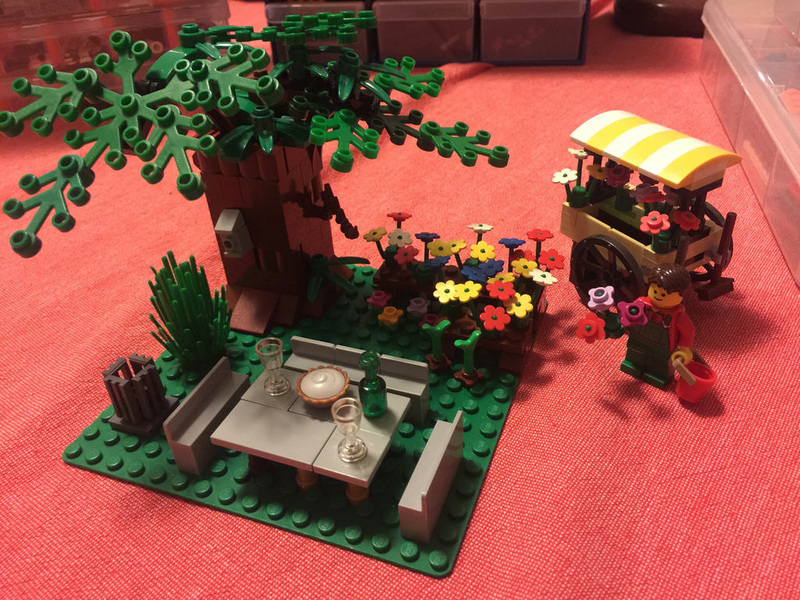 Originally this started as a picnic table under a tree (left image), but I decided to make it a bit bigger. 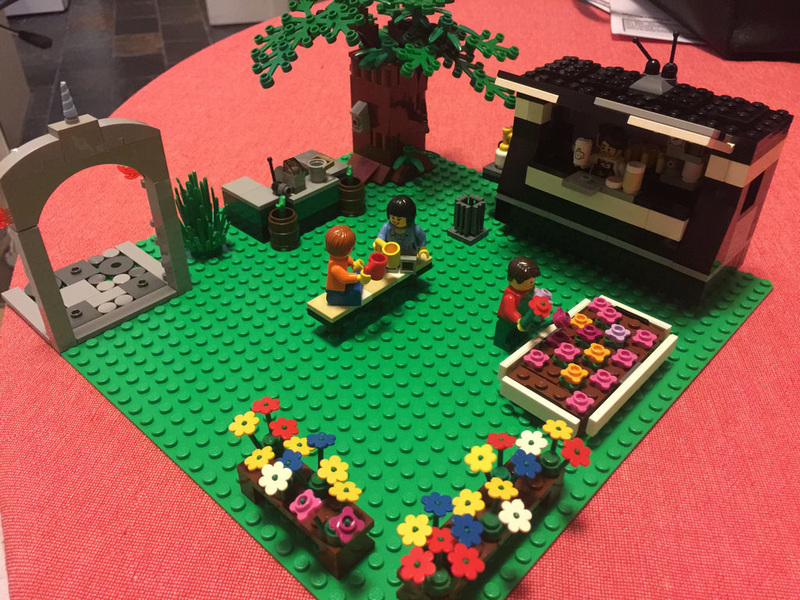 The final change was to add the coffee cart – I wanted a use for Larry the Barista! I was really happy with this one. It turned out great. Next up was the logging area. 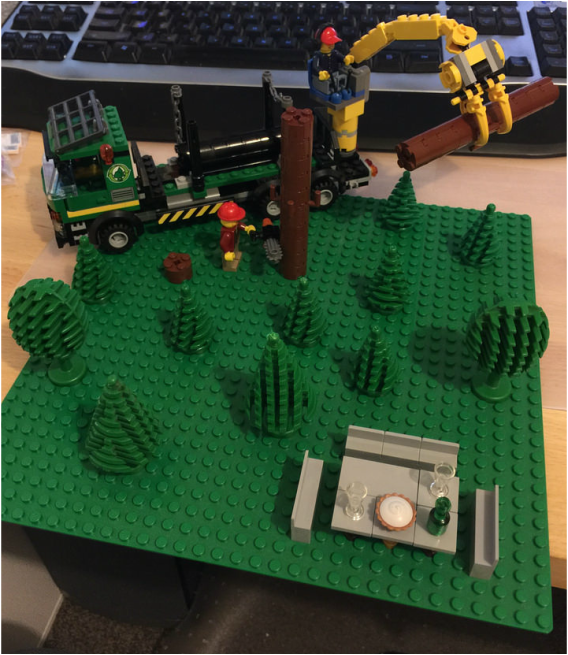 This was pretty quick – I moved the table over, and added the trees and logging truck. It was just a filler, so not meant to be flashy! The big one (which also wasn’t really a MOC) was the demolition zone. 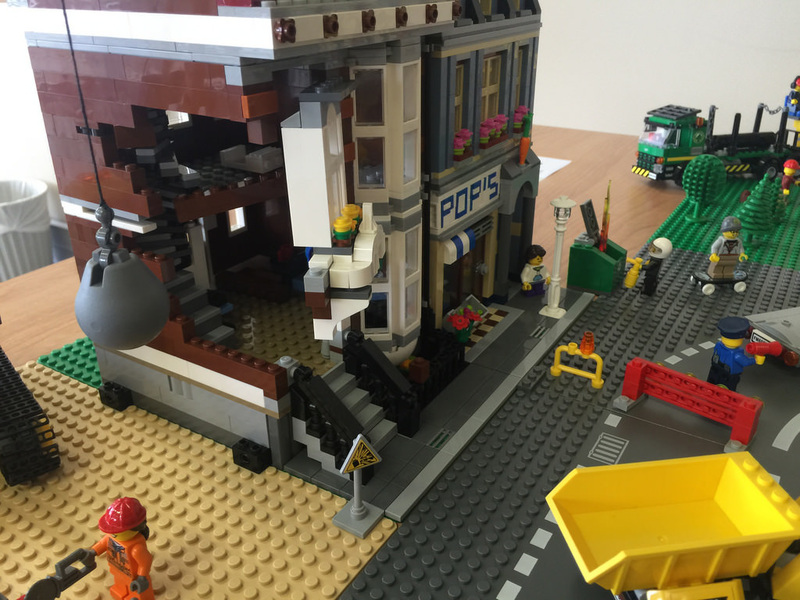 The first step was to half demolish the second pet shop brownstone. This was a little trickier than I thought. I had to rebuild the second level’s floor, as well as create some more damage at the front of the building, without losing some of the structural integrity. At the same time I changed the Pet Shop to Pop’s Green Grocer. The interior was a pretty simple swap, by changing the pet cages to shelves for produce. The sign was very hard though, and I had to cheat a little (sorry to the purists!). In order to fit the parts in for the letters, I had to place some items in loose. It works, but if you look closely, the Ps in Pop’s are a little dodgy. It still looks effective though, and that’s what I was going for! 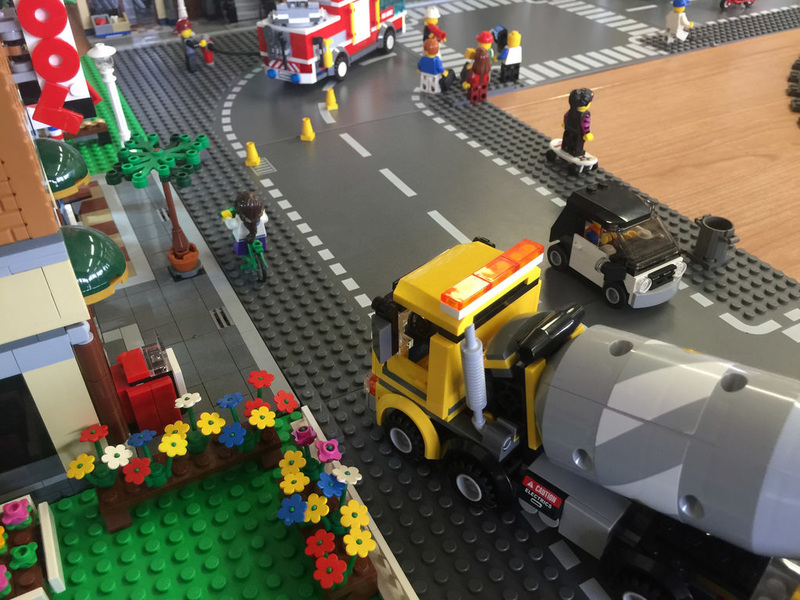 The rest was a simple matter of placing the vehicles and demolished buildings in place, and filling the blank spaces with patches of dirt (brown plates of various sizes and shades) and minifig workers. It was really useful to use the road as well, so I created some quick little barricades and grabbed two of my policemen to guard it. Finally, it was the campsite. I had a whole lot of spare LURPs and BURPs (if you aren’t sure what they stand for, check out the Glossary), so I thought I’d put them to good use. 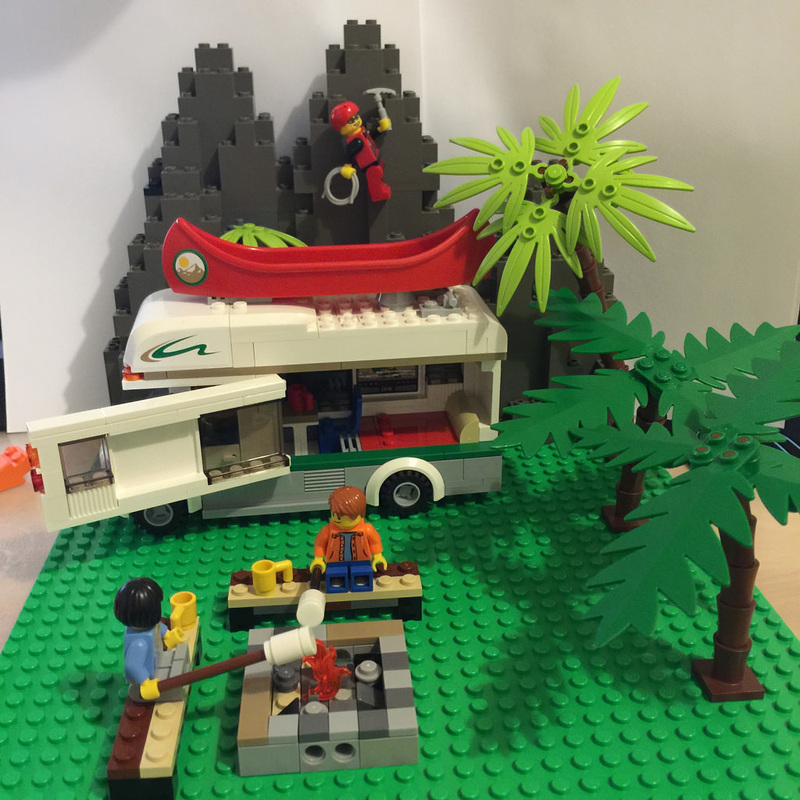 Then it was a matter of adding a few palm trees, the mountain climber for good fun, and the camper van. I realised there was a pretty big hole, so after looking around, I added a campfire. I’m still not happy with the edging or the benches, but I’m particularly proud of the marshmallows! Ok, that’s it for this part – it’s been a big one! Tomorrow I’ll be finishing it off with transport, setting up and final touches. 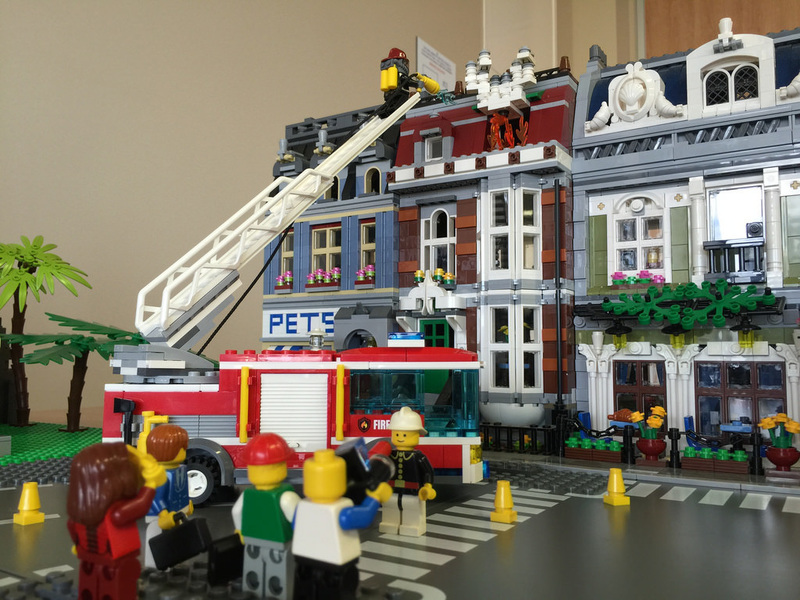 Have you ever created something for a display? What was it and what was your design process? Leave a comment below and let us know.